PURPOSE: Use this document as a reference for removing a new effective date row in Job Data, that was created incorrectly as a result of the Job Effective Dated Row Insert process, for a single group of employees. 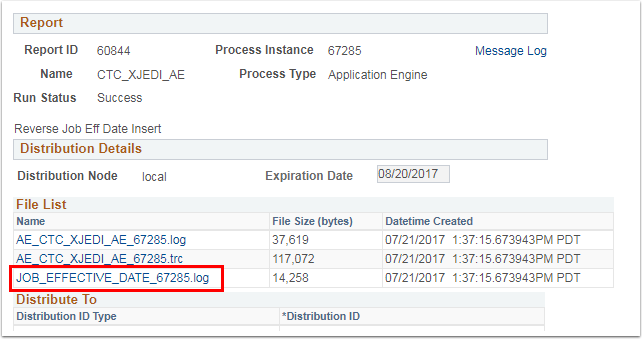 WARNING: All data entries for this process must be identical to the data entries used for the Job Effective Dated Row Insert that is being removed (i.e. Company, Effective Date, Action, Reason, Pay Group). Click the Add New Value tab. (This step is strictly for the first run; after that you may use this new run control). Create a Run Control (something unique and easy to remember). Enter/Select the Effective Date for the Job Data Insert. 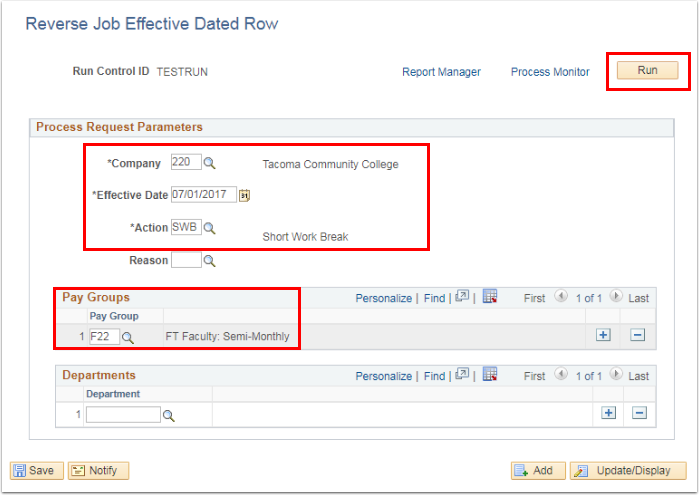 Select the appropriate Action for the Job Data Record. Select the appropriate Reason (optional but highly recommended). Select the appropriate Department (if applicable). Click OK (this will activate the run). Click the Process Monitor hyperlink to view the progress of the request. Click Refresh until the Run Status changes to Processing then to Success, and the Distribution Status changes to Posted. Click the Go back to Reverse Job Eff. Dated Row hyperlink. Click the Report Manager hyperlink. Click the CTC_XJEDI_AE report link. Click the JOB_EFFECTIVE_DATE hyperlink to view the actual results. (A separate window will appear containing the results. It is best to save or print these results for validation). Congratulations you have successfully inserted an Effective Dated Row into Job Data for a single Pay Group!!! !